I don’t get on very well with Bluetooth headsets. But it is not a prejudice against them. I don’t get on very well with Bluetooth headsets. But it is not a prejudice against them. I don’t get on well with those flat, saucer-like in-ear headphones either. My ears are just the wrong shape, and both objects end up giving me pain. If, that is, they stay in my ears long enough: the shape of my ears often means they simply drop out. Add to this that I wear glasses so that the over-the-ear grips that Bluetooth headsets sport can also be a problem. In addition, I have a preference for not looking like a Borg when out and about. None of this is a huge issue as most of the time I’m perfectly capable of raising a phone to my ear to take a call. So I don’t actually crave a Bluetooth headset. All that notwithstanding, in the course of my work I do get to see quite a lot of Bluetooth headsets. And to be impressed by the lengths that their producers can go to in order to differentiate their products. 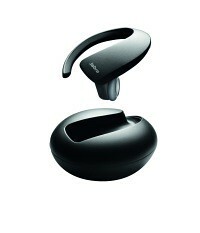 Jabra has just won the Sandra Vogel Bluetooth Headset Design Of The Year Award with its Stone. It is a stunningly clever, yet simple design which actually made me happy at the thought of testing the thing. The headset itself fits into a cradle which is actually a battery. The paring looks like a stone and fits neatly into a pocket or bag. The battery charges via microUSB. MiniUSB would have been better right now in terms of giving the greatest chance of finding a cable when you need it, but microUSB is up-and-coming so you should be in good stead for the future. You can always carry the provided mains power charger if you need to. I am not a fan of its incredibly short cable – just 27cm. Inevitably you’ll need to leave the Stone on the floor while it is charging. Don’t tread on it! There are no buttons on the headset itself, which, like its cradle has a black rubbery finish. At the very bottom end, by the Jabra logo, is a section you can depress to answer and end calls. A couple of lights on the inner section give power and Bluetooth status displays. To alter the headset volume you run a finger up and down the body of the headset. It feels very like scratching your ear. Pairing was no problem. The headset wants to pair as soon as you turn it on, and it took less than 30 seconds to make the bond with my phone. It was happy to pair with a second handset immediately afterwards while remaining paired with the first. It can cope with eight devices and two at the same time. Sound quality and volume weren’t an issue either. The double microphone system – which uses one mike to pick up voice and a second to eliminate background nose, seemed to work well in all but the loudest of situations. And so, on to the ergonomics. Here’s where things can fall down bigtime. The Jabra Stone is designed to be worn in the right ear. Because it is made in one piece it is, obviously enough, not size-adjustable. Luckily for me it fitted my ear well, but if yours isn’t size compatible, you are in trouble. That’s quite an issue. This is an expensive piece of kit at £100, and you don’t want to buy it on a whim. Amazingly I did not experience any in-ear discomfort. There was some annoyance in the glasses area but not a huge amount. And the headset did not make me feel like a Borg both because I quickly became unaware I was wearing it and because it looks quite discrete. Talktime is two hours, standby time two and a half days. Charging from the battery takes around 2 hours. For more information visit www.jabrastone.com.